1. Melt the butter in a large saucepan, add the onion and celery, cover the pan and cook over a medium heat for 4-5 minutes, stirring occasionally until softened. Meanwhile, core and chop 1½ apples, then add to the pan with the garlic and cook a further 2 minutes. 2. Add the prepared celeriac, stock and shredded sage leaves, bring to the boil and simmer for 20-25 minutes until the celeriac is tender. 3. Carefully blend with a stick blender or in a food processor until very smooth. Season. Cut the remaining peeled and cored apple into small dice. 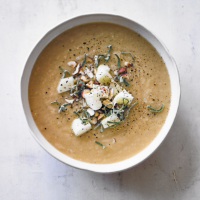 Serve the soup scattered with diced apple, sage and chopped hazelnuts.